As cliché as it may sound, our weekend trip as “Roadies” for the Kansas Travel and Tourism Faces and Places tour, had something for everyone. On our way back to Lawrence, my boyfriend, Hank, his mother, stepfather, sister, and I each reflected on personal highlights of the journey. The five of us (along with two small dogs) had left early Saturday morning on a four-stop tour of McPherson and Chase counties. I volunteered for the trip because I grew up in rural Kansas and small-town culture is important to me. I also looked forward to having a press pass to ask strangers what they were doing. That said, I’ll never forget the people, places, and stories we discovered. Like Andy Brack and his seven-year-old daughter, Avery, from Charleston, South Carolina. We ran into the traveling companions Sunday morning at the Emma Chase Café in Cottonwood Falls, KS for Biker Breakfast (the third Sunday of every month). Andy told me that when he was his daughter’s age, he went on an unforgettable road trip from South Carolina to Washington with his father. He’s giving his daughter a similar memorable experience by spending the next week driving through rural Kansas. 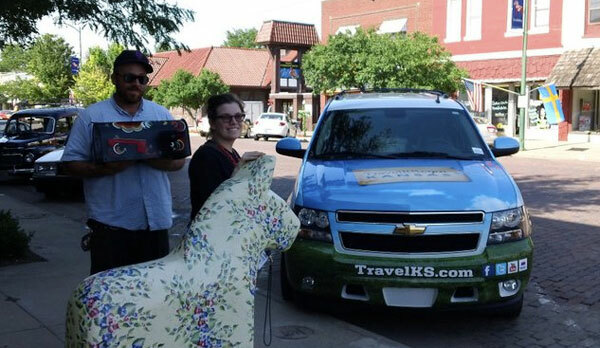 Armed with their Kansas Travel and Tourism guide, map and I-Phone opened to TravelKS.com, the two were on a father-daughter driving tour of Kansas. Hearing their story reminded me of the movie, Paper Moon. Filmed partly in Kansas in 1973, Paper Moon stars real-life father and daughter, Ryan and Tatum O’Neal. The comparison ends there, however (in the movie, the two pair up and swindle their way to St. Joseph). Andy wrote an article about his discoveries for the Charleston Currents. Andy and Avery reminded me of another father-daughter duo I had met on the trip: Jeff Parker, director of operations for Rolling Hills Wildlife Adventure, and his daughter, Morgan Parker, teen volunteer. They were working together at the park outside of Salina, our first stop Saturday morning. Although it was a busy afternoon at the park, they both gave me an interview about the park and the teen volunteer program. While we talked, several families who were celebrating reunions, birthday parties, and weekends out entered the park. Hank and his parents toured the museum at the other end of the park. The museum holds the largest collection of taxidermied animals in the world. Visitors are allowed to walk among the displays, both robotic and still, which are not enclosed behind glass… trust me, photo opportunities galore! We couldn’t stay long because we had two more stops that day, beginning with Marquette, KS. Marquette, KS is the kind of place you visit and immediately start looking for real estate listings. It has a sweet and lively downtown and the nicest people you could hope to meet. Met by knowledgeable and kind City Coordinator, Fred Peterson, we first visited the Kansas Motorcycle Museum. Started by Stanley “Stan the Man” Engdahl and his wife, LaVona, the museum features more a hundred rare motorcycles and the six hundred plus trophies that Stan won during his competitive motorcycle racing career. I could tell that Stanley was one of those inventive and resourceful Kansans who is the pride of this state. And his wife, LaVona, who currently curates the museum, has the sense of humor and spirit to bravely ride sidecar. Fred and I then went across the street to a city office where he showed me his own gallery in the back. The hall was lined with his own artistic creations, supersized prints of individual leafs that he had found and cleverly named. Next door, at the ArtSpace Gallery, I met local artists, curators and kindred spirits Mri Pilar and Rich Thibodeau. This contemporary gallery features unique work from seven local artists in two large spaces and a lounge area with drinks and snacks. Next we went to City Sundries, where high school students, Kasey Kolling and Joe Rifai, told me about the impressive amount of drinks, food, and desserts offered. Down the block at the Washington Street Emporium, I met store owner Mary Piper. She is a talented storyteller and recounted the tale of a great bank robbery that happened in the 1930’s (be sure to go in and hear it from her for yourself). I ordered a tasty barbeque pulled pork sandwich from the Valley Café (cash only, but there’s an ATM across the street) and we pulled out of downtown. We took Fred’s recommendation and stopped by the Hanson-Lindfors Mansion, listed on the National Historic Register, before leaving for Lindsborg. Owner, and Marquette Mayor Allan Lindfors took us on a tour through the house that boasts original woodwork, fixtures, furniture and stained glass. The tour ended with the original one-room cabin that the Hanson family lived in for seventeen years. Even more remarkable considering that they had eight children. If you’d like to arrange a tour, call Allan Lindfors at home, 785-546-2348, or work, 785-546-2292 to arrange a time. Also, don’t just show up (He told us about a morning when he and his wife came down in their pajamas and had a couple waiting in their kitchen). It was then a fifteen minute drive to Lindsborg, KS. The Midsummer’s Festival has been on my list for quite some time. We arrived during the tail-end of the afternoon section of the festival. Luckily, we were in time to see plenty. 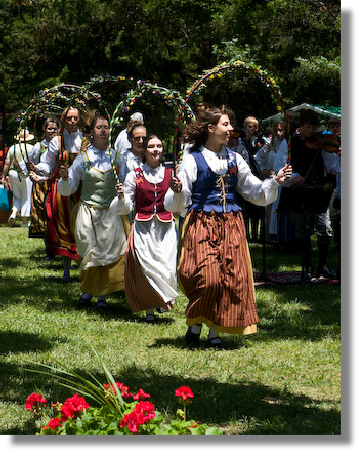 Every year the town of Lindsborg hosts Swedish natives who perform traditional music, dance and song. Speaking to several of the locals, I discovered that almost everyone I met had visited Sweden as part of a trip that the high school students and their sponsors take every four years. We met a lot of friendly festival attendants, volunteers and vendors. When the afternoon festival ended at 4 p.m., we packed up the car and drove a few blocks away to downtown. Hank and I bought a Swedish-style, hand-painted mailbox at the Anderson Butik and snapped a picture of the artist. Tired from a full day, we headed out of town, but not before stopping to hand over the raffle prize (a TravelKS.com cooler/travel seat) to Carol G. at the Öl Stuga. This weekend I learned a few things about my native state. If you are looking for authenticity, get off of the interstate and go to smaller towns like Cottonwood Falls. Sue Smith, owner of the Emma Chase Café, told me about the history of the unique cafe and its many events (the jam sessions on Friday nights are listed as one of the “Eight Wonders of Kansas Customs.” She also informed me of a unique local cooperative store, Prairie PastTimes, that sells local authentic, handmade crafts along with antiques. Second, bring some cash because some restaurants like the Emma Chase Café don’t take bank cards. Next, there is a lot to discover by just asking for recommendations. If it weren’t for Fred Peterson, I probably wouldn’t have found out half as much as I did about Marquette (nor met as many nice people). Also I learned that bikers and cyclists are bringing business to the small towns throughout Kansas. So, remember to “Look Twice.” And, finally, nothing can bring a group of people and a couple of dogs closer than a good old-fashioned road trip. Suzie Johannes works for jones huyett Partners in Topeka. As a graphic designer she works with visual materials for all accounts. She is a native of Powhattan, Kansas, but has called Lawrence her home since graduating from KU in 2006. In her free time, Suzie enjoys playing music and exploring Kansas in search of all things quirky with her boyfriend, Hank, and their hairless dog, Gerty.